I’ll never forget driving through the steep and windy I5 corridor of the Klamath Mountains when I moved to Oregon. Wet roads bordered by thick fog with protruding trees that were lusciously green. Very, very green. This concept of ‘Keeping Oregon Green’ started as a fire prevention act, and Oregon’s color is a quality that visitors and residents adore. Unfortunately there is sleeping giant that is gaining momentum, slowly turning Oregon’s forests from green to yellow with an eventual needle fall of the iconic state tree. This color change is from a microscopic fungus that all Douglas-fir trees have around the world, but for some reason it’s only harming the trees along the Oregon coast range. Our guest, a 4th year PhD student Patrick Bennett, is peeling away the layers of complexity to reveal why Oregon’s green forests are dwindling. 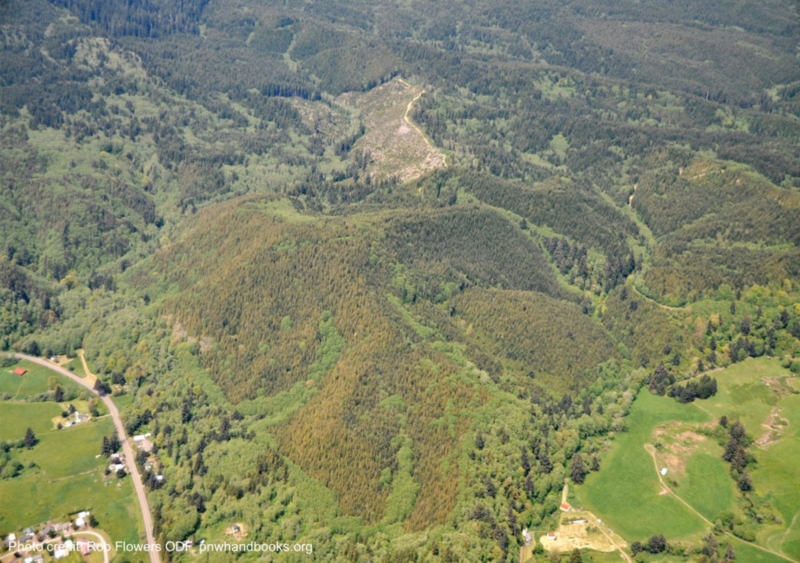 Aerial view of Douglas-fir stand with Swiss needle cast near Tillamook, Oregon. Chlorotic (yellow) foliage is a major symptom of the disease. Douglas-fir needles with pseudothecia (fruiting bodies) of the fungus (Phaeocryptopus gaeumannii) emerging from the stomata. It is estimated that Swiss Needle Cast disease is affecting nearly 1,000,000 acres in Oregon and Washington alone leading to economic losses estimated at $128 million per year. The fungus covers the stomata, openings in the needles, used to exchange air and water essential for plant metabolism. As more of these stomata become clogged the tree cannot make enough glucose so the needle dies, turns yellow, and eventually the needle falls off entirely. Douglas-fir trees typically keep needles for five years, but in heavily affected areas the needles last one year before falling off leaving the tree extremely thin and frail. Even though the fungus does not directly cause death, it leaves our iconic state tree highly susceptible to drought, beetles, nutrient limitations, and wildfires. This disease was first discovered in Switzerland, hence the name Swiss Needle Cast, in the 1920’s. At that time it was only negatively affecting Douglas-fir trees planted outside their native habitat. But since the 1980’s the natively planted Douglas-fir trees, within a narrow band parallel to the coast range, are showing annual growth decreases by as much as 50%. Recently there have been advancements in molecular biology and computing power that allow researchers to identify the genetic heritage of pathogens. Using these tools scientists can focus on population genetics to figure out why there is such a discrete area affected along the Oregon coast range. Some evidence points to warming winters and fungal-subspecies expansion as reasons for the spread of this fungal disease. But Patrick has indications to suggest it’s death by a thousand cuts and begs the question of whether the future of forestry is in danger. Growing up in southern California Patrick wasn’t exposed to the forests he studies today. It wasn’t until he attended Humboldt State University where he got his first exposure to towering canopies and ecology. His first research experience was in the Lassen Volcanic National Park in California where his advisor, Dr. Patricia Siering, pushed him to develop his own scientific study. Needless to say he was hooked on science and after taking a mycology class he also knew he was jazzed on studying mushrooms so he continued his passions that lead him to Oregon State University. 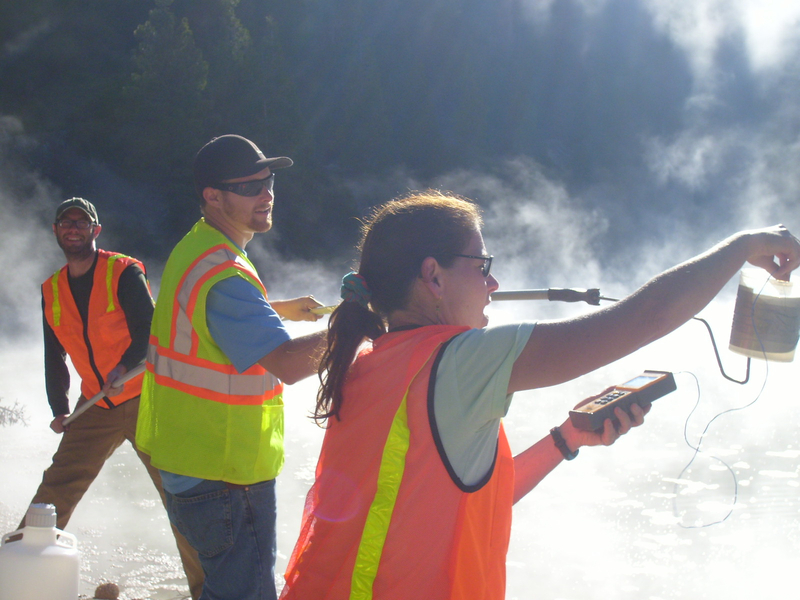 Dr. Patricia Siering (Humboldt State University – Biology Department) collecting boiling hot sulfuric acid from Boiling Springs Lake in Lassen Volcanic National Park in Northern California with the help of undergraduates and graduate students. Patrick Bennett is a 4th year PhD student in Dr. Jeff Stone’s lab in the department of Botany and Plant Pathology housed in the College of Agricultural Sciences where he is investigating how population genetics can be used to better understand the factors contributing to the recent emergence of Swiss Needle Cast as a damaging forest pathogen in the native range of Douglas-fir. Be sure to tune in Sunday April 30th at 7PM on KBVR Corvallis 88.7FM or by listening live. 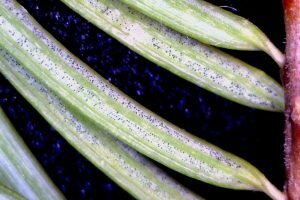 This entry was posted in Botany and Plant Pathology, College of Agricultural Sciences and tagged douglas-fir, Forestry, oregon, Swiss Needle Cast on 2017-04-30 by Adrian Gallo.